Nonprofit newsletters are a great way to keep you in touch with your readers, whether you're a freelancer who wants to stay in front of your clients (or those who might want to use your services) or a ministry, nonprofit, or small to mid-size business. Your readers already know you. You’ve earned their trust. When you send a regular newsletter online, print or both, you build that relationship by staying in touch. 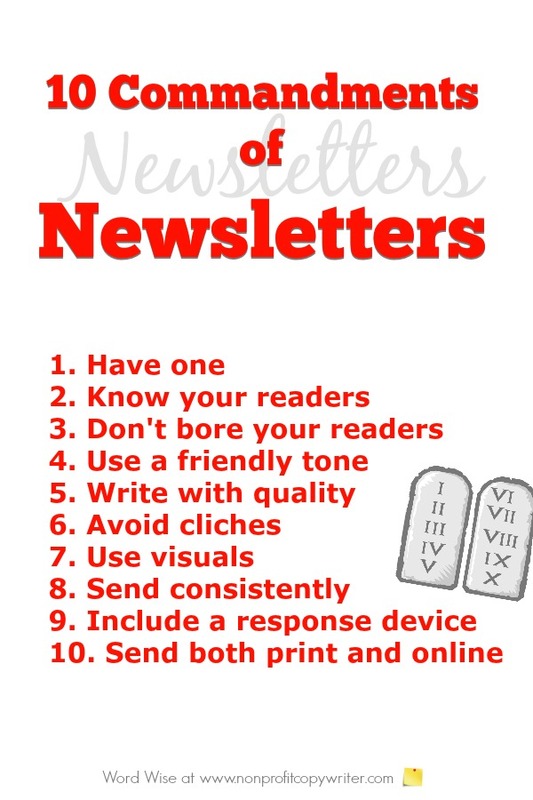 You build further credibility when you follow good, fundamental principles - these 10 commandments for writing a newsletter. Nonprofit newsletters are a primary means of communicating with your donor base and reinforce the wonderful work you’re doing. Over time, they also provide a way to document your organization’s history. Understand their hot buttons and why they have partnered with you in the first place. Speak to those issues. Use this checklist to clarify your readers. Provide fascinating content and newsworthy updates, not boring in-house strategy summaries. Include engaging stories about your beneficiaries, how-to’s, event information, data, profiles, and anecdotes about those you serve. Make sure your content has substance that supports your mission. Ads and promotion are secondary (and most of the time, unnecessary and inappropriate). Check out a list of content ideas here. Well-constructed articles, eye-catching layout, and a professional presentation show the reader you are credible. If you don’t have time or staff to put together a high quality publication, then outsource it. Keep verbiage to a minimum. Avoid niche lingo. Vary sentence length. Where possible, use lists and bullets for skimmers. Photos, action shots, graphs, charts, color and easy-to-read fonts make your newsletter user- friendly. The more personalized, the better. By sending regularly intervals (monthly or weekly for example) you demonstrate reliability and earn your reader’s respect. Send your newsletter as an ezine to readers who have email access, and archive back issues on your website as an informational resource.